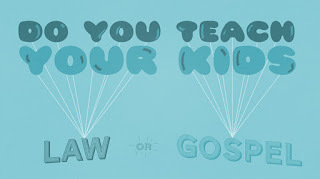 Do You Teach Your Kids the Law or the Gospel? Everything that isn’t gospel is law. Let us say it again: everything that isn’t gospel is law. Every way we try to make our kids good that isn’t rooted in the good news of the life, death, resurrection, and ascension of Jesus Christ is damnable, crushing, despair-breeding, Pharisee-producing law. We won’t get the results we want from the law. We’ll get either shallow self-righteousness or blazing rebellion or both (frequently from the same kid on the same day!). We’ll get moralistic kids who are cold and hypocritical and who look down on others, or you’ll get teens who are rebellious and self-indulgent and who can’t wait to get out of the house. We have to remember that in the life of our unregenerate children, the law is given for one reason only: to crush their self-confidence and drive them to Christ. The law also shows believing children what gospel-engendered gratitude looks like. But one thing is for sure: we aren’t to give our children the law to make them good. It won’t, because it can’t. In our hearts we know that’s true because the law hasn’t made us good, either, has it? Every way we try to make our kids good that isn’t rooted in the good news of the life, death, resurrection, and ascension of Jesus Christ is damnable, crushing, despair-breeding, Pharisee-producing law. “Good job, Joshua! Now what does the story teach us?” Mom asked. The Gospel is what should cause our hearts to turn to God. The law cannot save us, but His standard is still righteousness. Jesus said, " If you love me, you will obey my commandments.". Teaching kids obedience to their Heavenly Father isn't wrong, but we want it to come from a heart that responds to his great love and belief that His ways are highest. Sometimes we need to follow God, though we don't understand or agree. The bible tells us such obedience in faith is rewarded. The gospel and law aren't mutually exclusive, for Jesus told us that in guving us the gospel, He fulfilled the law.